Verneuil is located at the intersection of the main roads which lead to Brittany and meridian Normandy and northwards to Rouen and the lower Seine, and in a southerly direction to Beauce and Loire Valley. Be careful! There is a village 12 kms to the South of us called La Puisaye - this is not us! Click on the map below to view a more detailed map of the area. From Paris: take the A13 motorway westbound. At the Rocquencourt intersection, take the right hand junction towards Dreux/Bois d'Arcy. Follow signs to Dreux. Stay on the N12 until Verneuil-sur-Avre but do not go into the town. At the traffic lights take the direction to Chartres (D839) and after 400 metres turn right onto the D56 (direction Beauche and Senonches)..
After 1.5 kms cross the C19 (marked "le Chemin du Chateau") and then right into the gates of the Chateau after the caretakers house. IF ARRIVING AFTER 19.00 pm TURN RIGHT ONTO THE C19. FOLLOW THE ROAD ALONG THE EDGE OF THE PARK AND THEN LEFT ONTO THE GR35 AT THE TINY CROSSROADS IN THE HAMLET. From Calais - take the N43 to Saint-Omer. Then take the D928 in direction of Abbeville. In this town, take the N28 straight to Rouen. 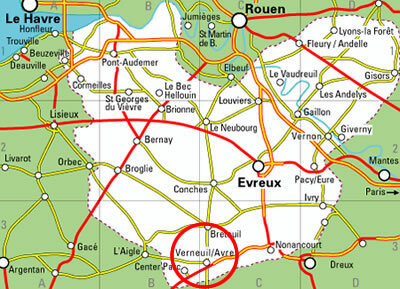 From Rouen, take the N138 to Elbeuf, then take the D840 until you are in Verneuil-sur-Avre. If you land at the Paris airports (Roissy Charles de Gaulle and Orly), there is a direct train from the Paris Montparnasse station . Verneuil-sur-Avre is located on the Paris - Granville line and should take around 1 hour 30 minutes.